My daughters Faith and Jill joined me in a Pre-80th Birthday party and book launch at Women and Children First Bookstore. Because our crowd was over 140 friends, we moved the book reading to the nearby Swedish American Museum. In this photo my daughters are doing their "thinly veiled" routine to hint that my novel hits pretty close to the author's life. I was delighted to be the featured speaker at the National Council of Jewish Women's Spring Fundraiser. I'm joined in this photo with organizer extraordinaire, Donna Gutman. 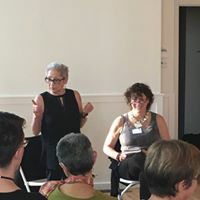 Village Chicago, a non-profit membership community focused on helping members navigate the new longevity by connecting them to each other and to trusted resources that support vibrant, secure later lives, hosted this event Oct. 19, 2017 at Conrad Sulzer Regional Library. I interviewed the delightful Sherry Stanfa-Stanley, author of Finding My Badass Self: A Year of Truths and Dares. It was fun, and jealous-provoking, being on the other side of questions. Greg Danger Komorowski's graduation class at Second City's "Humor Doesn't Retire." I played a member of the synagogue board, who was conveniently named Elaine, in Season Three, Episode 3 of my daughters' show, "Transparent." You can read more about my short-lived, but fun fame, in the blog post "Showbiz" from the Hometown Rookie series. On Saturday, June 11, 2016, 6:30 p.m., I presented a Staged Reading of my original pilot, Layover at Chicago's iO Theatre, Chris Farley Cabaret. My amazing cast included: Joe Bill, Sophia Mia Canale, Diane Cohen, Tyler Davis, Meghan Flood, Susan Messing, Chuck Otto, Anne Taubeneck, Greg Taubeneck, and Edwin Wald.The story: Upended by the sudden death of her husband, Linda Simon rents out spare bedrooms to flight attendants and pilots. Lives entangle between the widow, her guests, and the once-placid Chicago neighborhood. Elaine Soloway in Conversation with Mary Schmich, March 14, 2016, A New Leaf, for the AntiDefamation League of Chicago. Elaine Soloway has lived the past four decades of her life out loud and in the public eye. 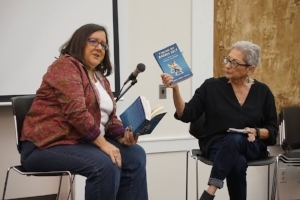 At the age of 77, Elaine has three successful and widely-read blogs, has published three books, and most recently has seen aspects of her lifeimmortalized on the Golden Globe and Emmy Award Winning “Transparent,” which is produced and written by her daughters, Jill and Faith Soloway. Through a combination of traditional and social media, Elaine shares her life generously with her readers – exposing both her successes and challenges to public scrutiny. A lifelong Chicagoan, she writes about moving to the West Coast — and discovering she was happier back in her hometown. She muses about her desire for companionship, about her first husband’s external transformation and the illnesses that ended her second husband’s life far too soon. She tackles the ageism that pervades our society, the stress of caregiving, her passion for city living — all with her signature warmth and a wicked sense of humor.